Born on April 21st of 2002, Trenton was born special. We knew that he was going to be special (and a little spoiled), he was the first grandchild on both sides of our families. Little did we know just how special he was going to be. After having a typical uneventful pregnancy, he was born a bigger boy than we expected. 8 lbs 7 ½ oz’s & 21 inches long. We took him home & started our new life together. For a few weeks, we thought we had the best baby ever. He slept soundly with us having to wake him up to eat & he never really got upset. Then the signs started… at about 3 weeks of age. He developed thrush in his mouth, had hiccups a lot & was constipated. The pediatrician assured us that all of this was normal. But on May 27th, we saw with our own eyes that something was not normal. Trent was lying on a blanket in the middle of our living room and starting having a seizure. It lasted only a few minutes then he was fine. Then a second seizure followed. After arriving at Kosair Children’s hospital in Louisville, KY – he was immediately put on Phenobarbital, and had an EEG, MRI, & CT scan. He had seven seizures total that day. That next day, we met an angel right here on earth. Our neurologist, Dr. Vinay Puri. Without this man, our little Trent would have not be alive today. After a couple days of constant blood work, numerous tests and a muscle biopsy, Dr. Puri told us that he believed Trent had Leigh’s Disease. The life expectancy of Leigh’s disease is 5 to 6 years. Of course, our families were devastated. We were in the hospital for eight days on our first stay, so were ready to go home and enjoy what time that we had left with Trent. We went home from the hospital with instructions to take 7 or 8 over the counter vitamins/medicines. On our first night at home, Dr. Puri called and proclaimed the good news that Trent didn’t have Leigh’s but he had PA. Knowing only that PA had to do with protein, we thought “Oh wow, we will have to buy everyone a cookbook so that we make Trent friendly dishes.” Little did we know, that PA would impact so much more than our cooking. The first month of officially knowing it was PA was rough, going for blood work every few days to check Trent’s levels. Dr. Puri, who had never heard of PA before now, was communicating with Dr. George Hoganson for guidance on how to treat it. We were put on Carnitine, Biotin & Propimex 1. We could see Trent staying awake for longer amounts of time so we knew that we were on the right track. The feedings were still a battle though after a 4 oz bottle feeding, we would hold him in our arms for an hour or more to avoid the refluxing or projectile vomiting. This went on for a few months and then in July we ended up back in the hospital because we couldn’t get him to eat. He was becoming life less again. By this time, we had been introduced to OAA. While at our July hospital stay, we urged for a g-tube & Nissan. Dr. Puri agreed that it was the right thing to do. We were in the hospital for 18 days (and we thought 8 was a lot before!). Going home with the G-tube, we were finally able to meet the real Trent. It was like a miracle. Being able to get all of his needed calories into his system, he immediately become alive. We have a photo album and it makes you so sad just to look at the photos taken of him before the g-tube was placed. The g-tube was definitely the best choice for us. There had been so many days in his first few month of life, where he didn’t even have the energy to cry even during a blood draw. So these days, his just hearing him cry was music to our ears. the afternoon and takes him to her house until I am off work. Our lives were getting some routine to them, not a typical family routine – but it’s ours. We had adjusted our schedules and outings to accommodate his every 3 hour tube feedings. Trent did really well for about a 4 month stretch, only requiring one quick 2 day stay in the hospital for fluids until Nov 2002. In Nov, he and I came down with a nasty stomach virus. This resulted in another 18 day hospital stay for us. Thanksgiving was nearing and we desperately wanted to be at home for the holidays. But Trent could not get rid of the diarrhea. While feeling desperate for some helpful medical advice, we got in touch with Julie Hardin in Lexington, Kentucky. She put us in touch with Dr. Rani Singh at Emory Genetics. Thru the advice of Julie & Dr. Singh, his diarrhea was finally stopped and we were released from the hospital the day before Thanksgiving. Since then, Dr. Singh follows Trent. She is another angel right here on Earth. She has helped us weather that same stomach virus since at home without a hospital stay. As the 2003 year went by, things were getting progressively better for Trent. 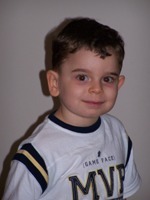 His early intervention was in full swing with PT, OT, Nutrition Services, & Speech. Our therapists proved to be awesome. At around 10 months old he sat up alone. begin crawling at around 14 months & walking at 19 months. The speech & eating parts were (and still are) by far the hardest. Trent said his first word, “MA MA” at around 23 month of age. Knocking on wood, the Nov 2002 has been our last hospital stay. Trent is 4 years old now & still delayed in every aspect but he is making progress daily. I would compare him to a 2 ½ year old child. He is doing much better with OT & PT. His attention span is still very short and he typically wants to play things “his own way”. His speech has really picked up lately too, although some of it is still hard to understand. His vocabulary probably consists of about 50 – 75 words and lately he is really into repeating what he hears. He will sometimes put a 2 to 3 word sentence together. He has private feeding therapy every other week. At this time, he gets nothing by mouth and will only drink when forced. Currently his feedings are every 3 hours with three oz of juice given between each formula feeding. At night, he is hooked up to an overnight pump. Having a tube feeding every hour & a half can be a little time consuming but since Trent has done so well with it, we prefer to just let it be. Outings are normally planned around the feeding schedules & the weather. We aren’t giving up hope that one day when eating becomes a social issue then he will want to take part and eat by mouth. He did attend preschool two days a week last year. He had terrible attendance (he was only there for 15 days) because he was always carrying home the latest germ. His 2nd year of preschool will be starting very soon. It is so hard to “let go” & send him to school – but we know that he needs the socialization side of school. His grandmother works at the same school, so it is comforting knowing that she is always nearby. Trent loves typical kid things – singing, coloring, playing in rocks, feeding the fish at his Papa’s & Nana’s house, & riding the four wheeler with his Pap. He is such a joy to be around. He has such a happy spirit about him (that is until you pull into his doctor’s office). We hope & pray that the next few years find us having a healthy Trent who is continuing to talk up a storm & eat some by mouth. We know that God sent us a special child for a reason & even though PA causes our family stress on a daily basis, we know that God blessed us when he chose us to be the ones to take care of such a sweet little boy. To see more pictures of Trent, check out the August 2006 newsletter.